The Rolex Pearlmaster is a sumptuous take on the classic Rolex Oyster. Characterised by its ornate dial and the exquisite gems that adorn it, it is a jewellery watch of the highest order. 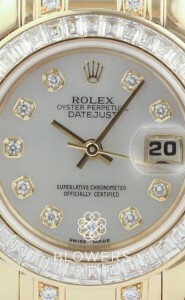 Rolex manufactures both men’s and women’s Pearlmaster models. Befitting the watch’s exclusive status, it is available only in 18 ct yellow, white or rose gold, made in the Rolex foundry. Launched in 1992, the Pearlmaster represents an ornate interpretation of the iconic Datejust. Its precious stones are carefully selected to meet the high standards of radiance in Rolex’s extensive gemology laboratory. They are hand-set by expert gem-setters. The Oyster Perpetual Pearlmaster is a stand-out model. 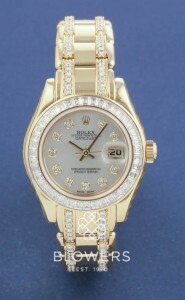 At Blowers Jewellers we stock a range of unused and used Rolex Pearlmaster watches. Each timepiece is carefully selected and serviced by our experts. The watches on our website are all physically in stock at our Kingston upon Hull Boutique. All watches can also be viewed, by request, at our office in Mayfair, London.